Shapeways will be hiring engineers (AKA pre-press technicians), machine operators, and fulfillment staff to support a new 3D print shop in New York City that can produce up to 5 million objects yearly. At a low-ball estimate of $10 each that’s a $50 Million business. We’re guessing each object we’ll probably sell for closer to $20. Seems like there is too much money on the table for traditional printing companies to ignore this market much longer. Want to learn more about 3D printing and how to add the capability at your company? CONTACT US. What Could HP Do for 3D Printing? As I was walking around the GraphExpo show in Chicago last week, one nagging thought kept recurring. What’s different from last time I was here? Sure there were a few new software players and some new digital presses, but really, what had changed since the last time I was there in 2007? Nothing really revolutionary. Pretty much every program, every device, and every finishing solution was dedicated to putting ink on paper. While I’m not ready to argue that print as an overall business is dying, some of the killer applications I saw in 2007 are either dead or on life support. Software manuals? Digital. Statements? Paperless. Just this week in fact, Newsweek announced that they’re going to a digital-only format after 80 years as a printed magazine. What is the industry’s plan for a future with even less print? I spent a lot of time talking with vendors like Lexmark and HP. I asked how they were doing in light of their companies overall performance and their respective decisions to exit the desktop inkjet printer market. Most seemed to feel insulated from that side of the business. In fact the production people at HP gave me the impression that they were one of the only shining stars inside the company. I sat in their booth wondering how long that tugboat could drag the barge behind it. They’ll need to pivot soon or get ready to join Kodak on death row. Then today I read this fascinating piece on how 3D printing could save HP. It seems like a natural pivot for them. They’ve got the infrastructure and experience of producing devices on a large scale. They understand the consumable side. They’ve got an extensive distribution network. They still spend a ton on R&D and could easily redirect some of it or acquire one of the many smaller startups that have taken an early lead in the 3D market. The market is developing rapidly and it seems new applications are being announced every day. To reach scale rapidly, a lot of infrastructure needs to be developed. So maybe the bigger question is, what could HP do for 3D printing? With their considerable experience in development, design and packaging, they could certainly help better “productize” 3D printers for the home market. With considerable technical and marketing resources they could help simplify the software, mainstream awareness of the technology, and flush out applications for its use. 3D4Printers: Are you aware of any other 3D printing shops in the UK or elsewhere? 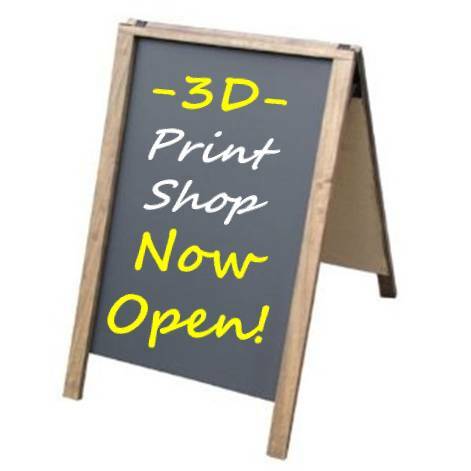 Aspiring Shop Owner: There are currently a variety of online 3D print shops that are based in the UK (although their services are only available online) – these cater mainly for commercial use and don’t market themselves to the everyday user. There are also small ‘workshops’ that can be hired out (similar to TechShop in the USA but smaller) that cater for students and small businesses looking to develop ideas. The few contacts I have in 2D print shops have also told me they have 3D printers but they seem very underused/under marketed and again limited for commercial printing. In today’s market where people are launching businesses at a record pace – many more out of necessity than as a sideline – speed to market is essential. Most entrepreneurs don’t have the resources or the time to bother with traditional methods. They look for solutions that get them to the finish line faster. Consider this example of Day2Night, a shoe retailer that allows women to change out the heel of their shoes to match the occasion. Pretty slick idea. To get the business off the ground the owner, Candice Cabe is using 3D printing to create prototypes of the heels she plans to sell. It’s an important step (pardon the pun) that could save significantly vs. committing to production before the product is tested. Also, it’s important to note that Ms. Cabe funded her company with Kickstarter, a crowdfunding web site that now requires project creator’s to demonstrate working prototypes of their product. While 3D printing is still too expensive for mass production, Ms. Cabe has also found it useful for beta testing and getting consumers to try her product. Certainly she’ll use the feedback she gains to improve her product before going to production, and also use it in her marketing messaging. We can only assume that consumer reviews will be as valuable to her company as they are to others when attempting to convert new customers. Do you have an innovative client that’s trying to launch a new company or a new product? Maybe they could benefit from this emerging technology. If you’d like more information on 3D printing and how you can incorporate it as a capability, CONTACT US today. While we don’t agree that there is no place for home 3D printing – there is, we think that like 2D printing, there will be different output workflows for different needs. 3D web-to-print and home 3D printing will continue to grow, but there will also be applications that require consultation with an expert and advanced finishing capabilities – services that traditional print shops provide today. Traditional printing companies have an opportunity to participate and benefit from this emerging technology. If you’d like more information on 3D printing and how you can incorporate it as a capability, CONTACT US today. 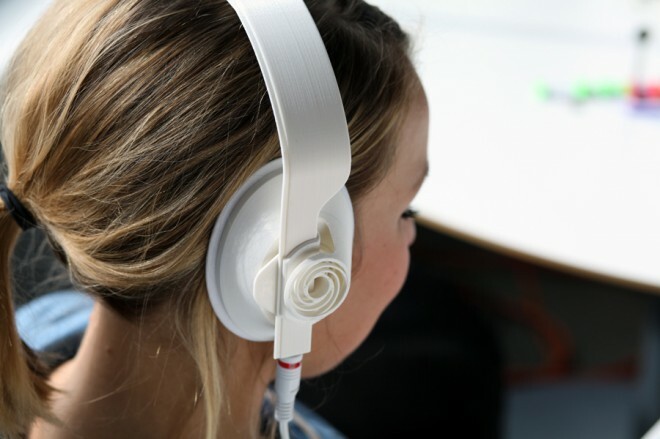 Here’s another interesting application for 3D printing – stereo headphones. Yes, headphones. Industrial design firm Teague came up with the idea to help consumers 3D print the headphone shells, while allowing them to source their own preferred electronics. They’re calling it the first example of “prototype as product.” They’re even accentuating the “grain” left behind by 3D printers as a style element. The market is developing rapidly and it seems new applications are being announced every day. Traditional printing companies have an opportunity to participate and benefit from this emerging technology. If you’d like more information on 3D printing and how you can incorporate it as a capability, CONTACT US today.